Pseudofolliculitis of the beard area is a very common dermatological problem in our geographical region. This could be partly because of the racial predilection as a large percentage of the population has curly hair and also may be due to local cultural customs which unlike the west do not encourage daily shaving of facial hair. We aimed to mainly study the dermoscopic features of cases presenting with pseudofolliculitis. Secondary objectives included evaluating clinical patterns and possible etiological factors. Twenty-four consecutive male patients presenting to a University Health Center over a 1 year period from January 2014 to January 2015 with a clinical diagnosis of pseudofolliculitis involving beard area and not on any active treatment for the same were included in the study. The clinical diagnosis was made by two qualified dermatologists. All the patients were included after informed consent was obtained from them. The study was approved by the Institutional Ethics Committee. Patient with other associated skin conditions which according to the investigators might affect clinical feature and/or management including, but not limited to, acne vulgaris, seborrheic dermatitis, rosacea, and other forms of folliculitis were excluded from the study. Patients with diabetes mellitus were excluded from the study. Patient history with regards to shaving habits, patient hair type, morphological patterns of the skin lesions, and dermoscopic findings were recorded. Dermoscopic images were shown to the patients and the condition and the principles of treatment were explained to them using the dermoscopic images. Majority of the patients had “curly” hair (18, 75%). Most of the patients had a usual shaving frequency of 2 or less per week. All the patients who were using razors mentioned that they tended to stretch the skin while shaving. The most common dermoscopic findings included - “Handle bar” sign showing curved hair attached to the skin on both ends [Figure 1], white areas (possibly indicating fibrosis) and scaling [Figure 2], underlying linear bluish pigmentation (indicating the buried hair shaft) [Figure 3], and linear vessels with occasional areas of hemorrhage [Figure 4]. Aerobic culture of specimens taken from the skin lesions showed positivity for Staphylococcus epidermidis in eight of the case. No other organism was isolated. There are very few studies which have tried to elucidate the dermoscopic correlates of pseudofolliculitis barbae. Thefirst case report was from Chuh and Zawar, who used dermoscopy to demonstrate the ingrown hairs and also suggested that showing the dermoscopy image to the patients can help them understand the condition better and thus help in achieving better compliance and treatment results. Ladizinski et al. described a unique dermoscopic feature of pseudofolliculitis barbae – in the form of a solitary gray-blue, thick curved line and adjacent red lines set upon a structure-less pattern. This pattern does not correspond to known dermoscopic entities such as basal cell carcinoma and seborrheic keratosis. 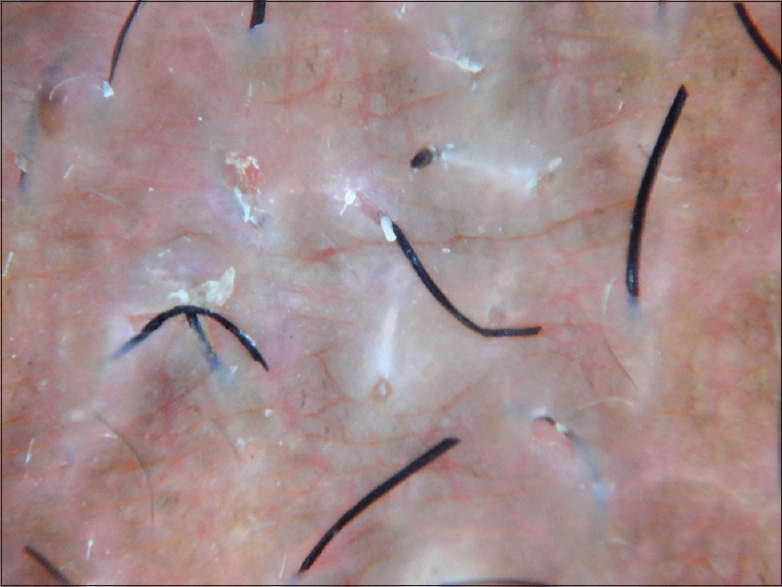 According to the authors, the solitary gray-blue, thick curved line corresponds to the edge of the tightly coiled cluster of ingrown hairs in the dermis and the red lines could represent aberrant vessels secondary to the inflammatory reaction. 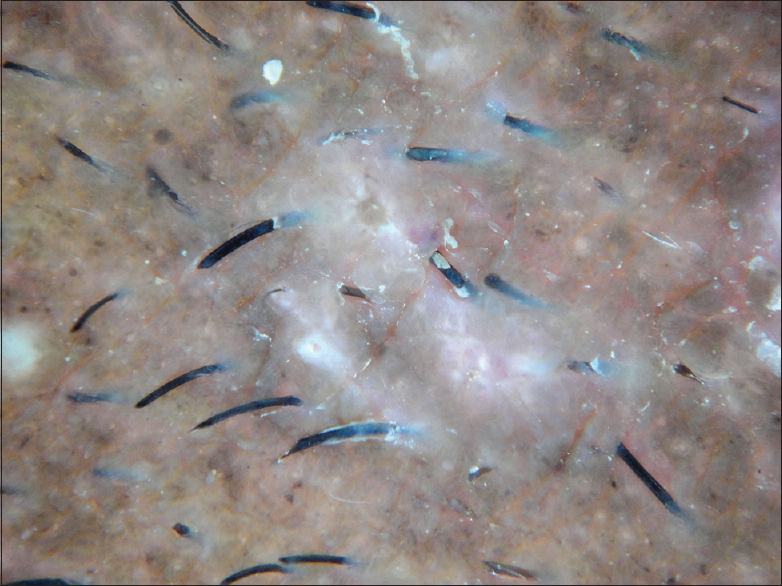 The gray and blue colors could be explained by the Tyndall effect due the melanin in the pigmented hair shaft in the dermis. Puhan and Sahu recently reported a case of pseudofolliculitis over the back of a patient. 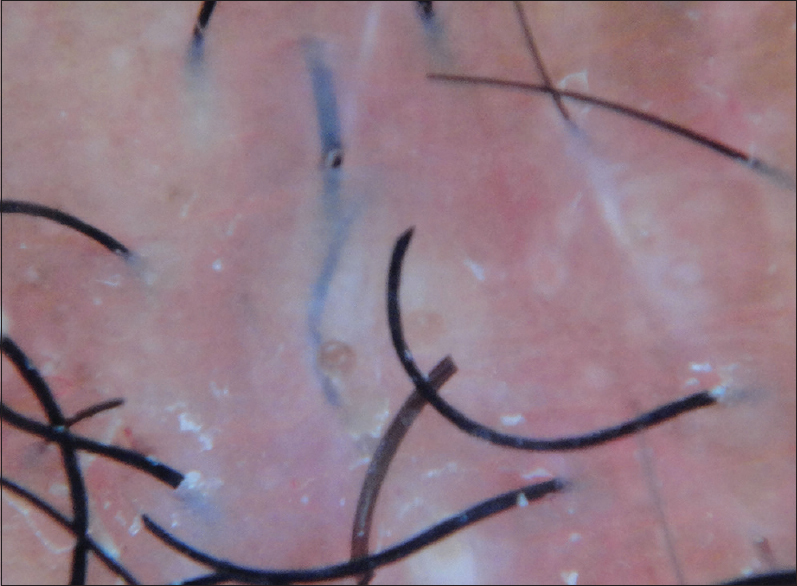 Dermoscopy in this case showed hair in the form of loops. The authors have considered the name “pseudofolliculitis corporis” for this condition which in this case was most probably induced by the effect of friction due to a pillow which the patient used to put behind is back while driving. Our study showed that the most common pattern seen in all cases was the curved hair attached at both ends – what we would like to label as the “Handle bar”. 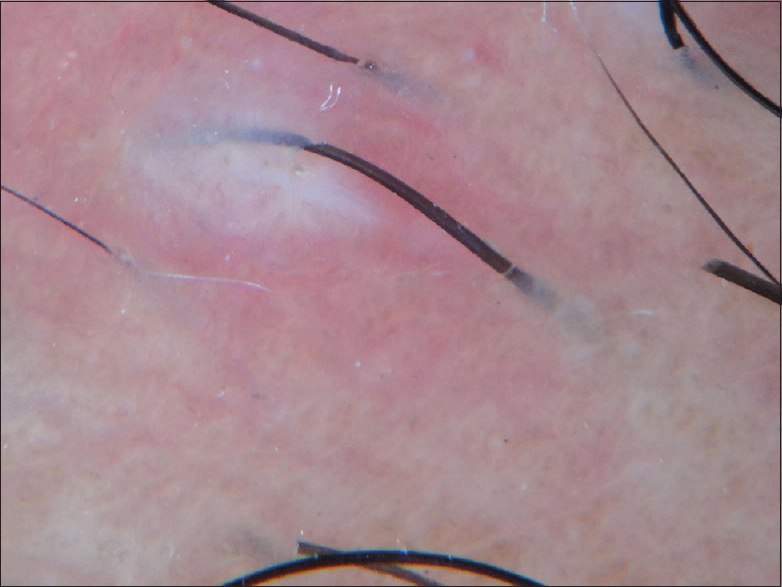 White areas with scaling, underlying linear bluish pigmentation (indicating the buried hair shaft) – similar to that described by Ladizinski et al., and linear vessels with occasional areas of hemorrhage were the other common dermoscopic patterns seen in our cases. Other studies have highlighted the predisposition of African race and curly hair to develop pseudofolliculitis., Another study showed that the Ala12Thr polymorphism of keratin K6hf of hair follicle may be partially responsible for the phenotypic expression. The racial and genetic factors might be important for explaining the high incidence of pseudofolliculitis in the population of our study. While we did not do a formal evaluation as done by Chuh and Zawar  to see if showing the dermoscopy images helped patient compliance, as done by us we feel that in general the patients had a clearer understand of the problem and the principles of treatment after they were shown the dermoscopy images. Dermoscopy shows characteristic features and can be a useful adjunct for diagnosis in pseudofolliculitis. Stretching the skin while using razors and growing the facial hair to a point where it has the length to curve might be important risk factors in the development of pseudofolliculitis. The lack of histopathological correlation is the main limitation in our study. Chuh A, Zawar V. Epiluminescence dermatoscopy enhanced patient compliance and achieved treatment success in pseudofolliculitis barbae. Australas J Dermatol 2006;47:60-2. Ladizinski B, Ramirez-Fort MK, Cohen YK, Rosendahl C, Elpern DJ. Pseudofolliculitis barbae: A dermatoscopic correlate. Dermatol Pract Concept 2013;3:53-4. Puhan MR, Sahu B. Pseudofolliculitis corporis: A new entity diagnosed by dermoscopy. Int J Trichology 2015;7:30-2. Alexis A, Heath CR, Halder RM. Folliculitis keloidalis nuchae and pseudofolliculitis barbae: Are prevention and effective treatment within reach? Dermatol Clin 2014;32:183-91. Perry PK, Cook-Bolden FE, Rahman Z, Jones E, Taylor SC. Defining pseudofolliculitis barbae in 2001: A review of the literature and current trends. J Am Acad Dermatol 2002;46:S113-9. Winter H, Schissel D, Parry DA, Smith TA, Liovic M, Birgitte Lane E, et al. An unusual Ala12Thr polymorphism in the 1A alpha-helical segment of the companion layer-specific keratin K6hf: Evidence for a risk factor in the etiology of the common hair disorder pseudofolliculitis barbae. J Invest Dermatol 2004;122:652-7.